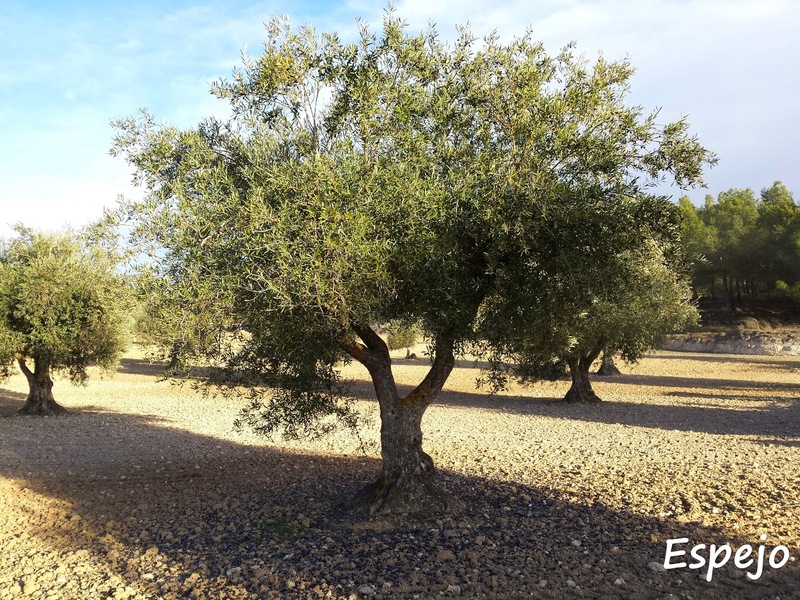 Some time before, we spoke about olive tree harvesting in our area; this task is normally carried out in December and January. 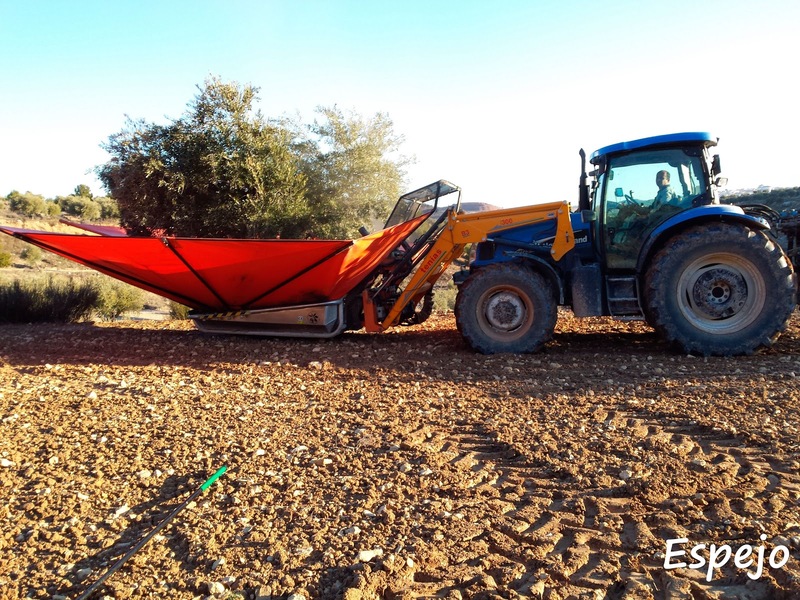 At this time, our friend and follower "Espejo" sent us some pictures and comments about his harvesting system on his working days in the Chinchón area. 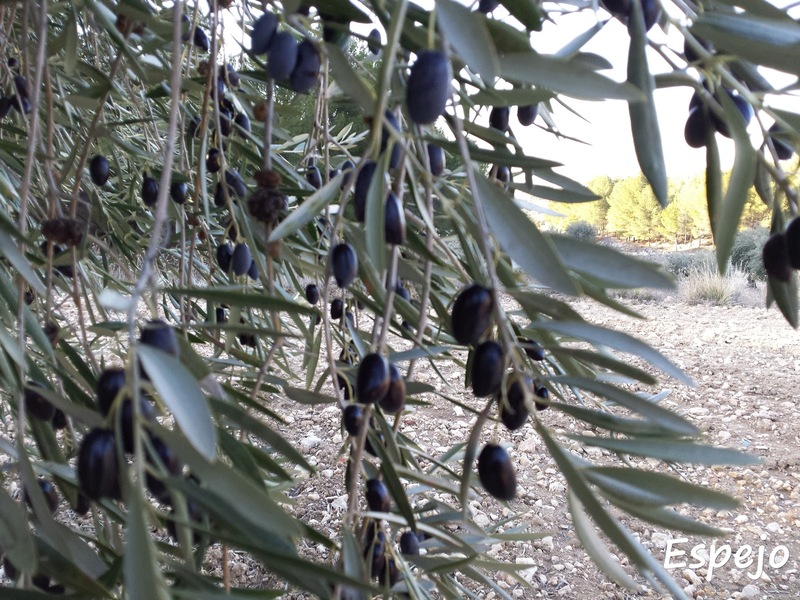 As he told us, he can harvest about 40 olive trees per hour if they have optimal conditions (they only have a trunk and the field is ok)... on the other hand, he can only harvest 8 olive trees if they are old or malformed. 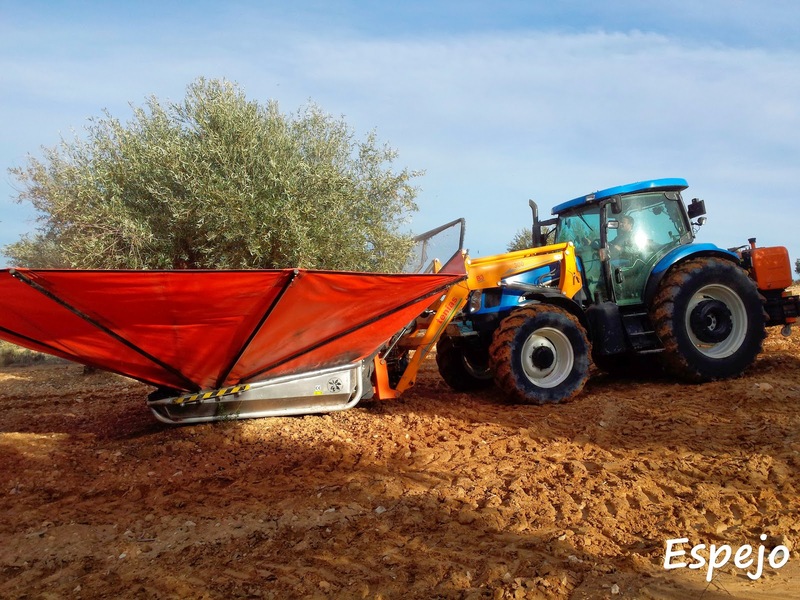 His machinery is the Agromelca VG3 (it is installed in the Tenías front loader of his Hew Holland TS-125A) which allows him to shake trunks from 8cm to 50cm. 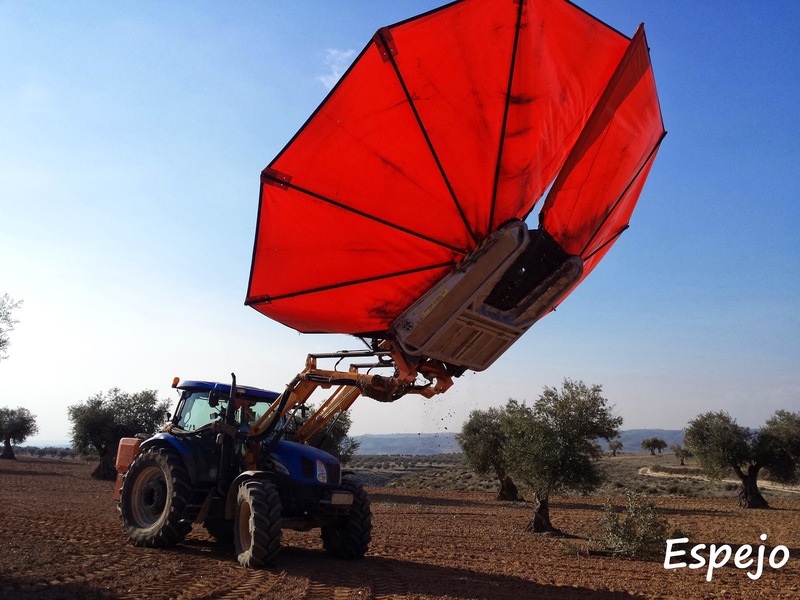 The olives are put into an aluminum hopper of 500kg that can be directly downloaded on the trailer as you can see in his pictures. 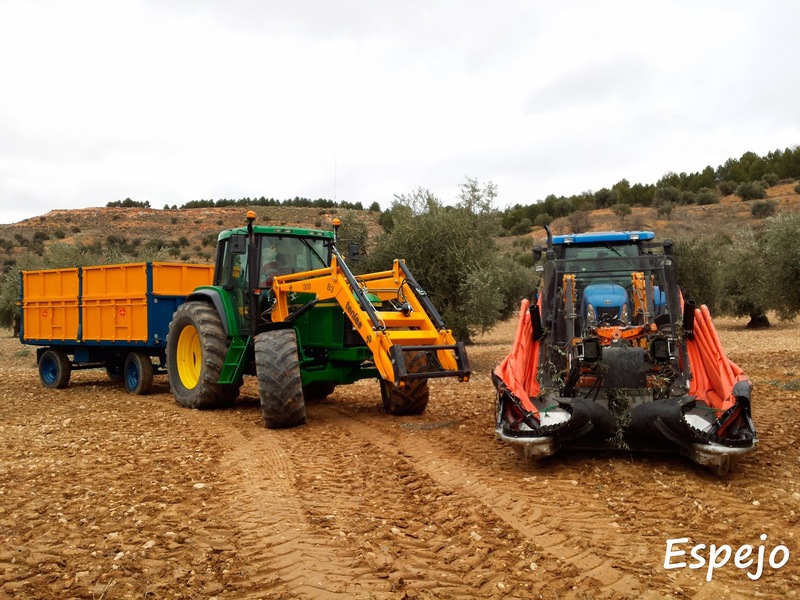 The system is based on shaking brands of olive trees through vibes of 5 or 10 seconds (he can change the vibrations power)... he manages all controls from the tractor cab or even with remote control. 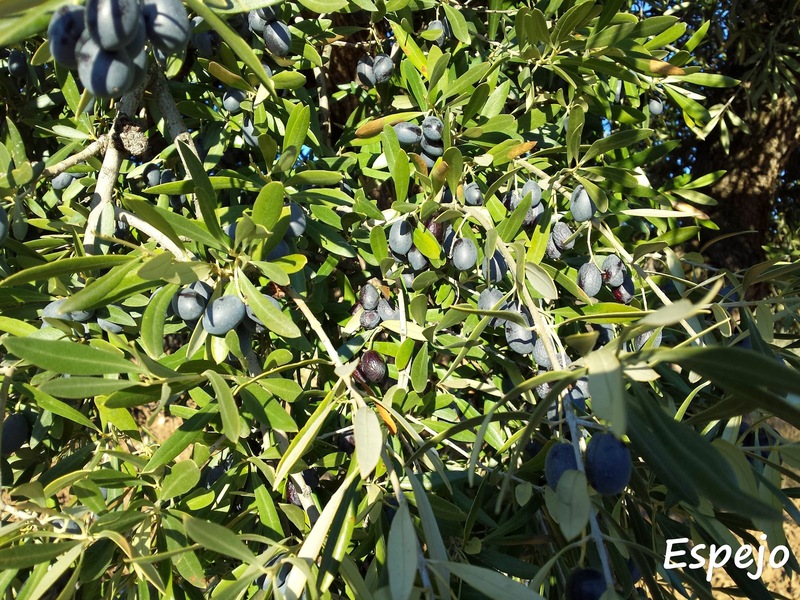 Apart from working in his olive trees, he offers olives jobs harvesting to other farmers in his area to amortize the machinery (he paid for it about 36,000€ four years ago). 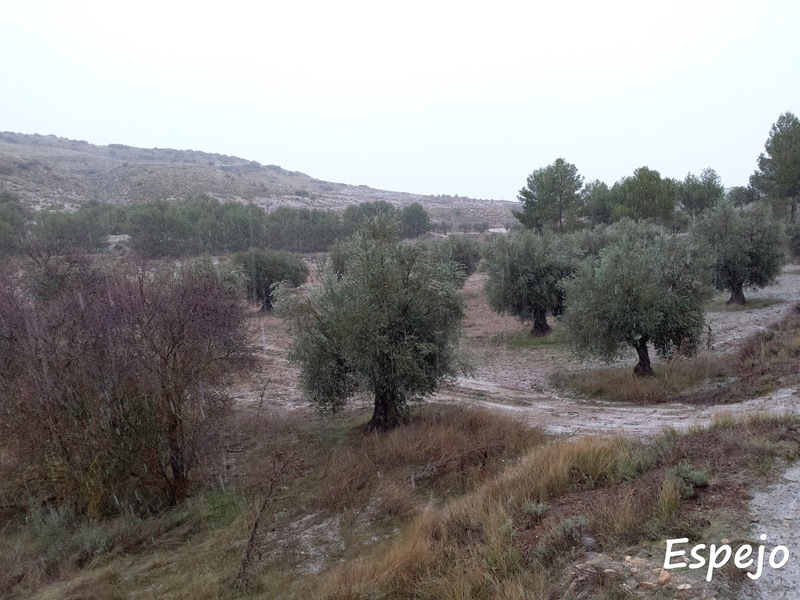 He charges 60€/h for this task. 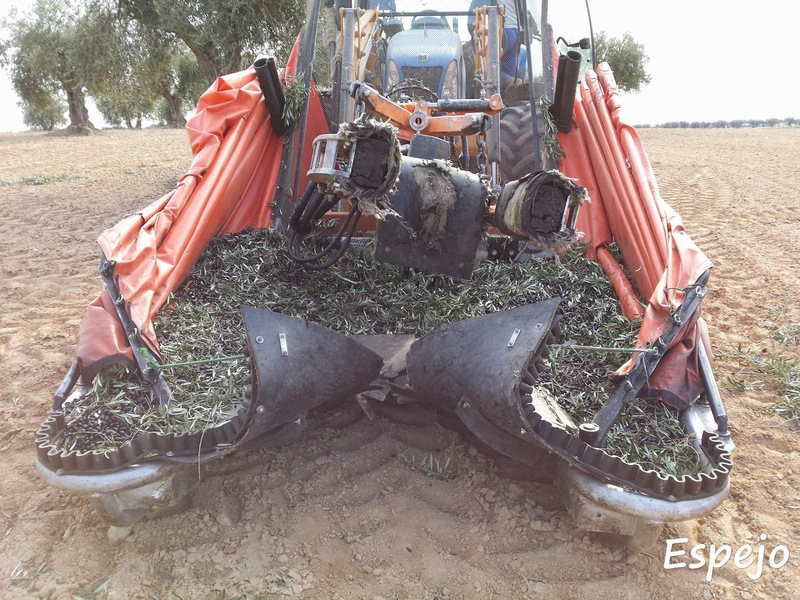 So far, he is very happy with this harvesting machine because he has not found any problems and he has only had to change a few parts what are worn down by normal use, mainly some pieces of the pincer used to catch trunk. You can see a video from here. 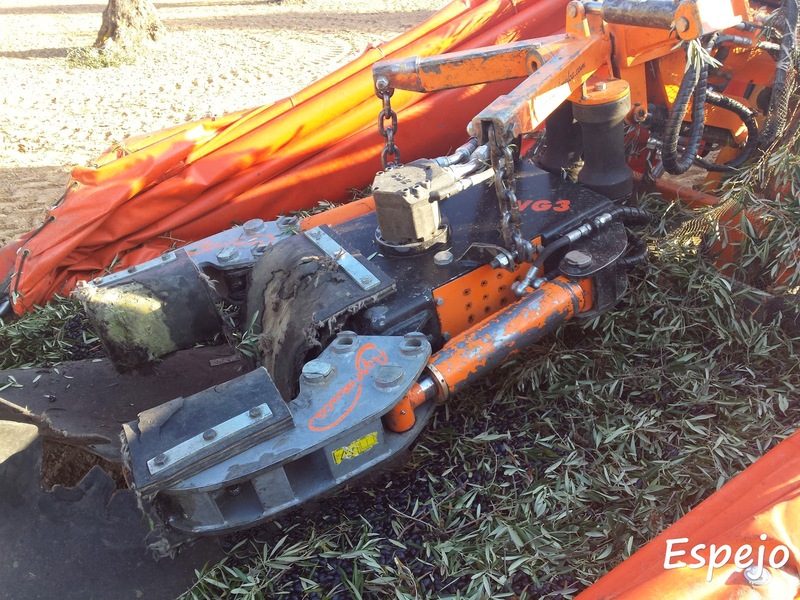 Have you tested this machinery? Do you think it would worth for you? 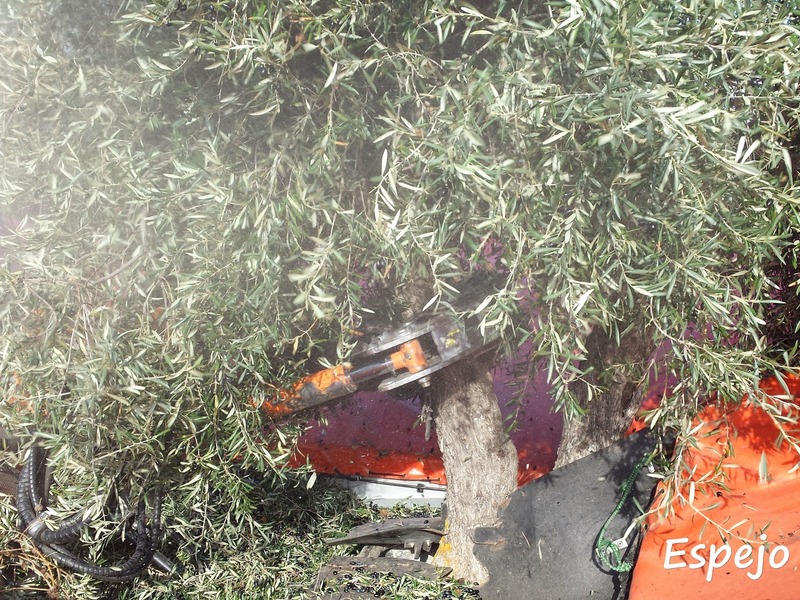 In my opinion, this machinery is for wide areas of olive trees, isn’t it? 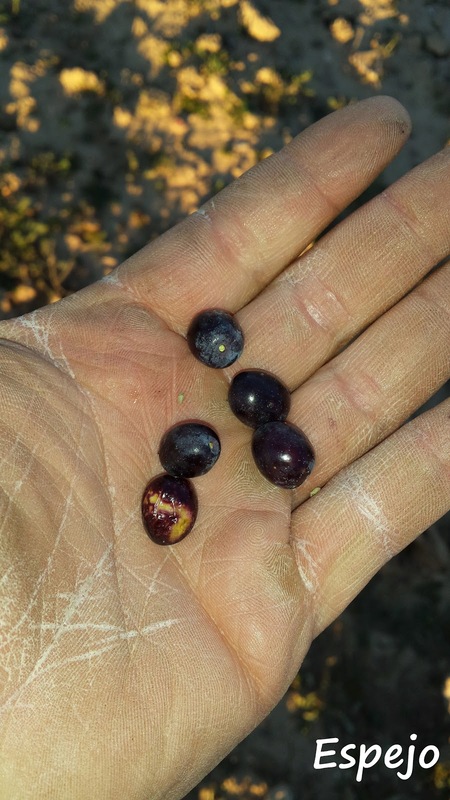 ¿Habéis probado este tipo de maquinaria en vuestras olivas? 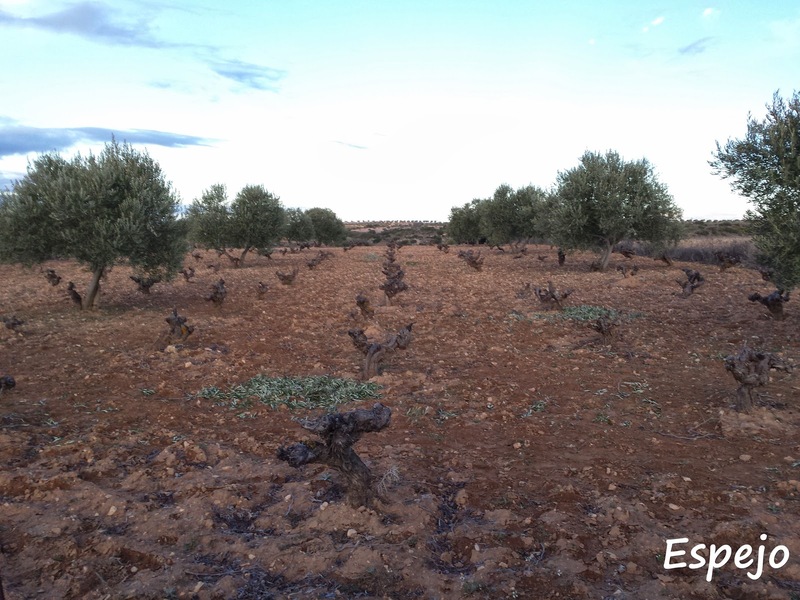 ¿Os merecería la pena una máquina así? 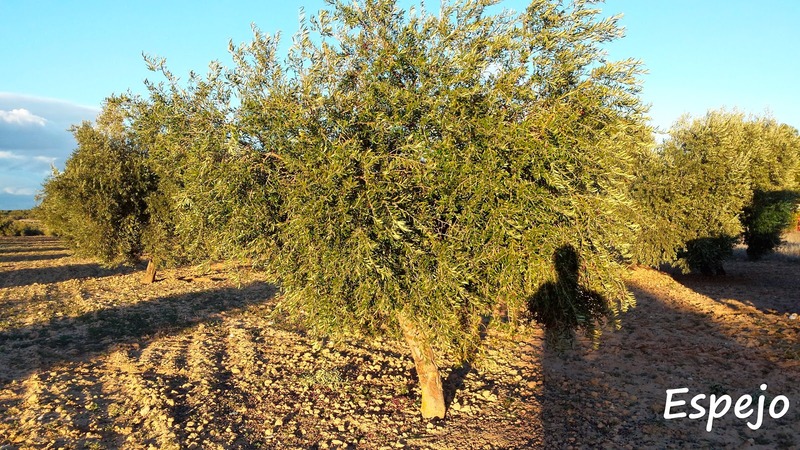 En mi opinión esta máquina es para extensiones muy amplias de olivar o para dedicarte a la cosecha de aceituna, ¿me equivoco? 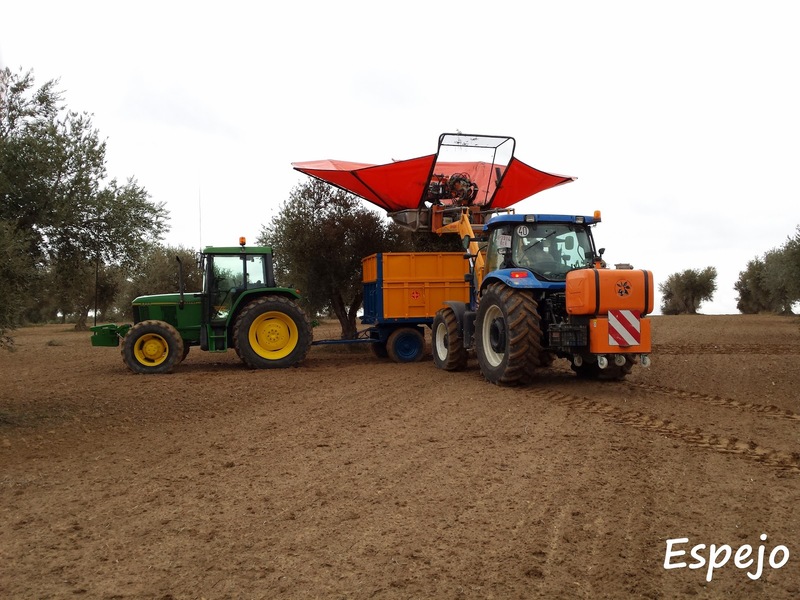 We think we can't use this machine with our olive trees because they don't have a trunk only... maybe, it will be very expensive for us. 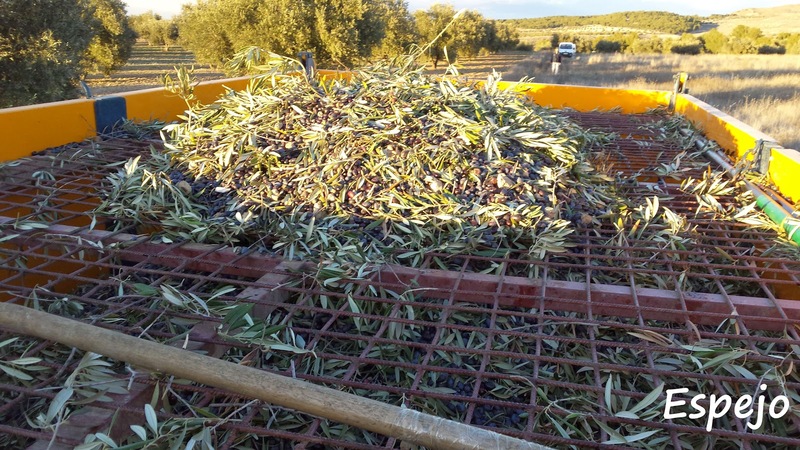 Pensamos que no podemos usar este tipo de máquina porque nuestros olivos no son de un solo pie (tienen tres), por lo que sería muy costoso para nosotros.